For my birthday this year, I bought myself two books I’ve been yearning for: Sequence Knitting and the KNITSONIK Stranded Colourwork Sourcebook. 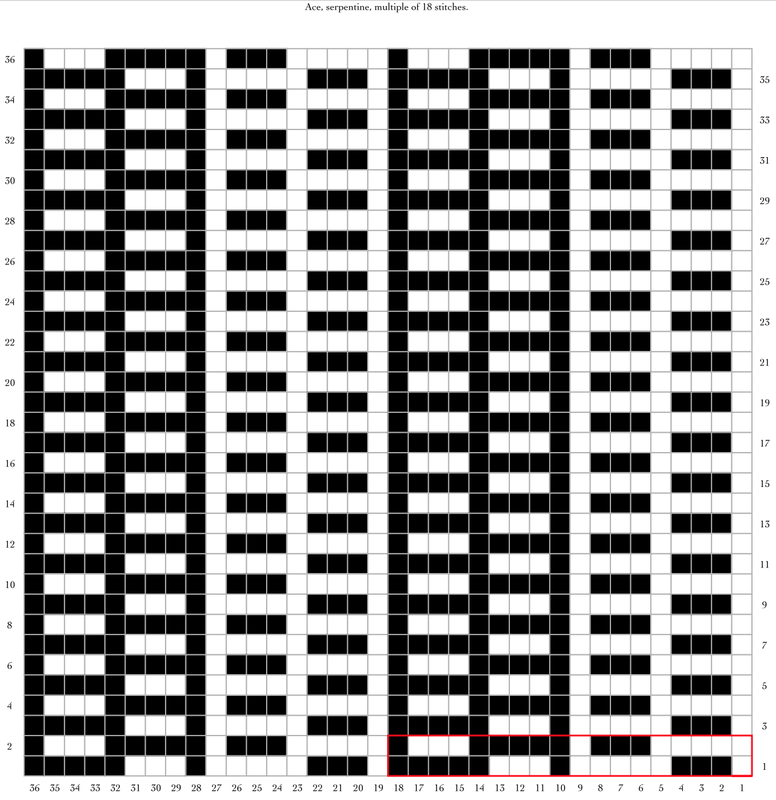 Both have to do, in rather different ways, with demystifying particular design processes, though sequence knitting is also a new method for knitting complicated patterns using extremely easy-to-memorize methods. I am pleased as can be with both these books. I’ve already learned a lot from both of them. I have so much to say about each of them that I can’t possibly review them both in one post. 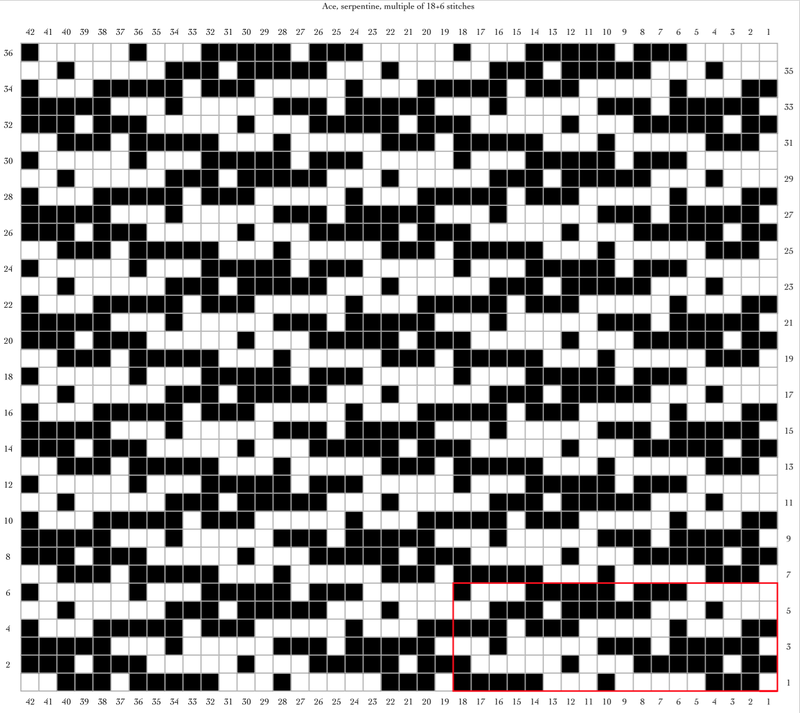 Sequence knitting involves taking a short sequence of stitches, for instance (k5, p3), and then working it repeatedly over a multiple of stitches that isn’t necessarily evenly divided by the stitch pattern. At the end of the row or round, the next row or round is begun where the sequence left off. The principle is very simple, but there is so much more to this book than that – sometimes an apparently simple idea has multiple complex layers behind it. Every time I look at the book, I learn something new about the structure or possibilities of the method. There is in-depth discussion of different categories of pattern. There are over 190 predefined stitch patterns in the stitch dictionary, along with 47 patterns for finished objects. Campochiaro also discusses the use of color. And finally, there’s the math. 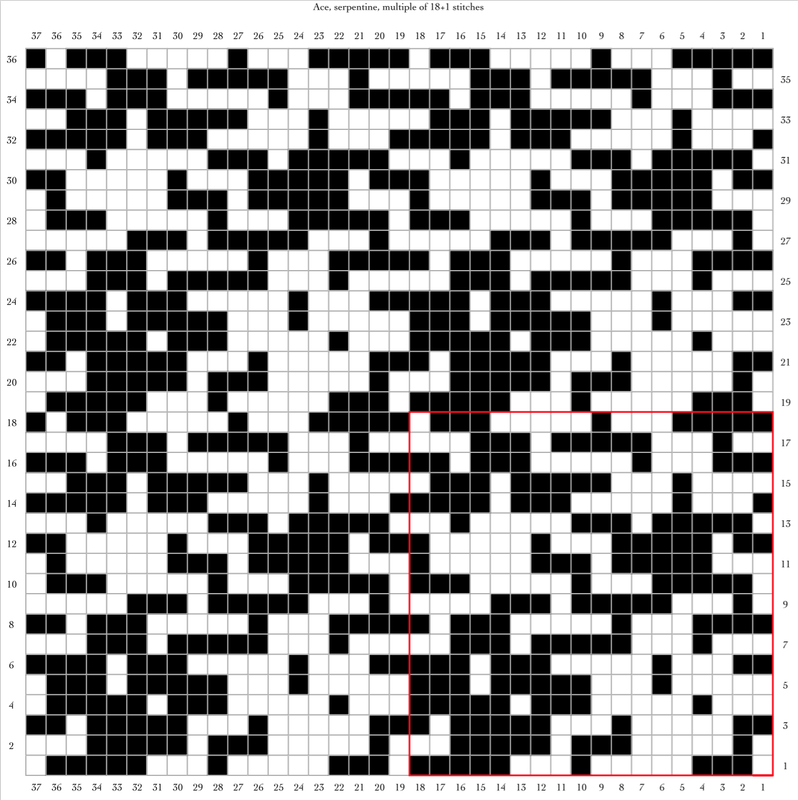 The math-phobic need not fear – the method is designed so that you don’t have to do math to knit something beautiful, and in fact one can knit something as complex-looking as Woolston merely by keeping track of a short, nine stitch sequence and casting on the correct number of stitches. But if you do love math, there’s far more here for you than in many other knitting books. Campochiaro has a background in science, and so she has included a lot of discussion of mathematics, including a section in the appendix where she works through a formula for calculating the number of patterns that exist for a sequence of a given length. This book is limited to patterns worked in knit and purl, and sometimes in more than one color, but this limitation helps with understanding the method. Campochiaro explains how the method could be used with other types of stitch patterns as well. Finally, a short review of the book as a book: it’s beautifully and artistically laid out, clearly written, and with a number of features that this trained librarian approves of: a good bibliography, a beautiful hardback binding, excellent illustrations, charts, and photographs that add clarity to the text, useful appendices, and the best index I’ve seen in a new book in a very long time. (It has “see” references! It has “see also” references!) This book is more than worth the $60 price. Recommended for: knitters who are already comfortable with the basics of knitting, who want something easy to knit on the bus or while talking to friends but are tired of plain knitting, who want to see more knitting books with math, or who want to start improvising their own stitch patterns within an easy framework. Highly recommended for libraries with patrons who knit, though I don’t know that the book is available through the usual library distributors. I think I might have done better to pick a different number of stitches to cast on, but given the arbitrariness of my decision (I cast on 41 stitches merely because I noticed when I was working retail that 41¢ in US currency uses one of each of the most common coins), I don’t think it’s a bad result. 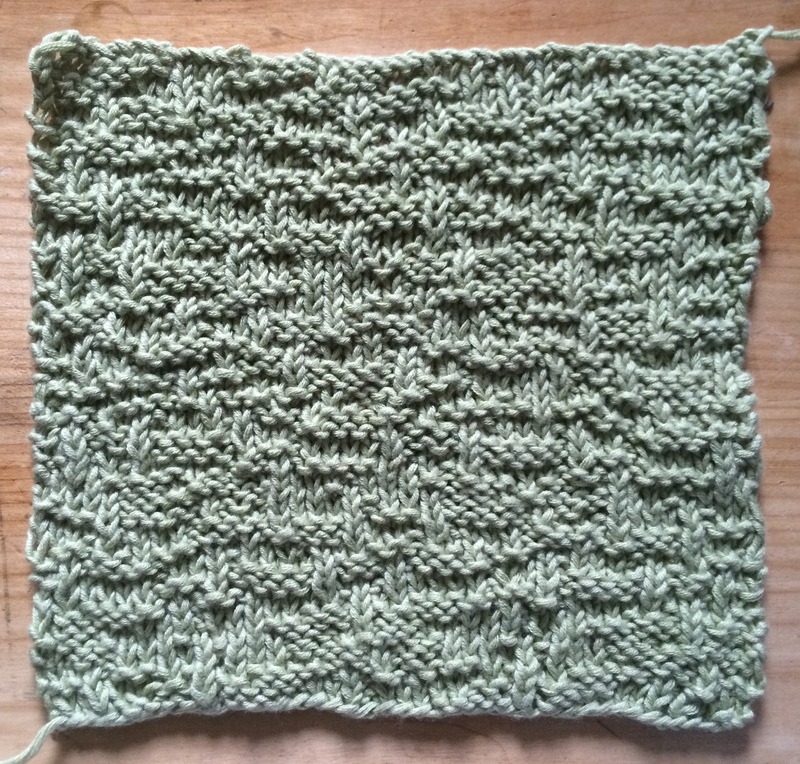 While I was knitting it, I also became temporarily obsessed with charting out the possibilities for knitting this sequence flat – the layout method is described as being serpentine because it winds back and forth. I’m not going to include all of them here, in part because several of them turn out to be the same design, translated or rotated, and in part because that would just take up a lot of space. But here are some of them; click on any of them to enlarge. I’ve shown them as black and white, though the black squares represent what looks like a purl stitch from the front. 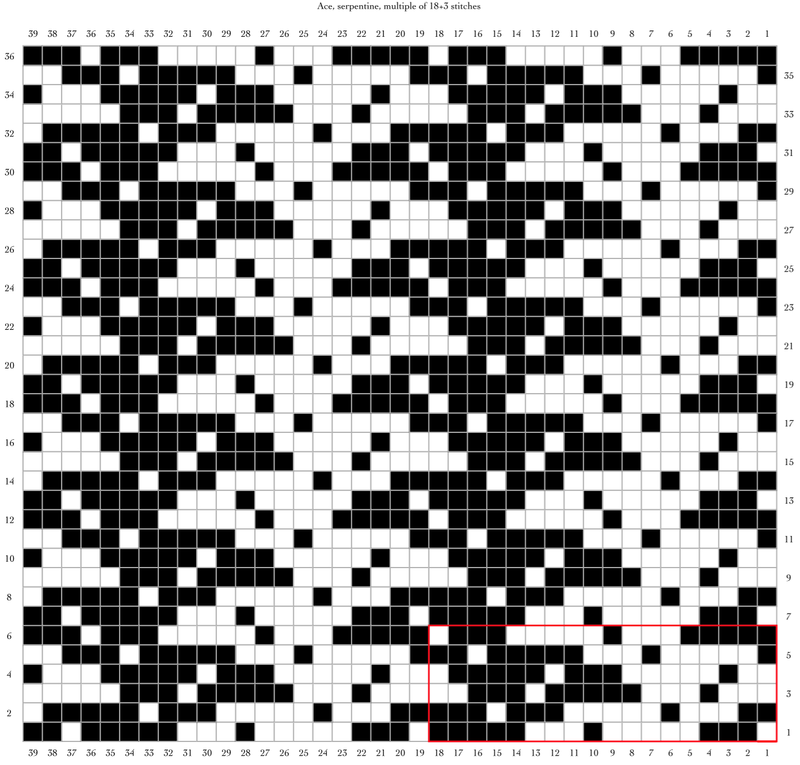 (Of course the black stitches that are worked on even-numbered rows are actually knit, not purled.) 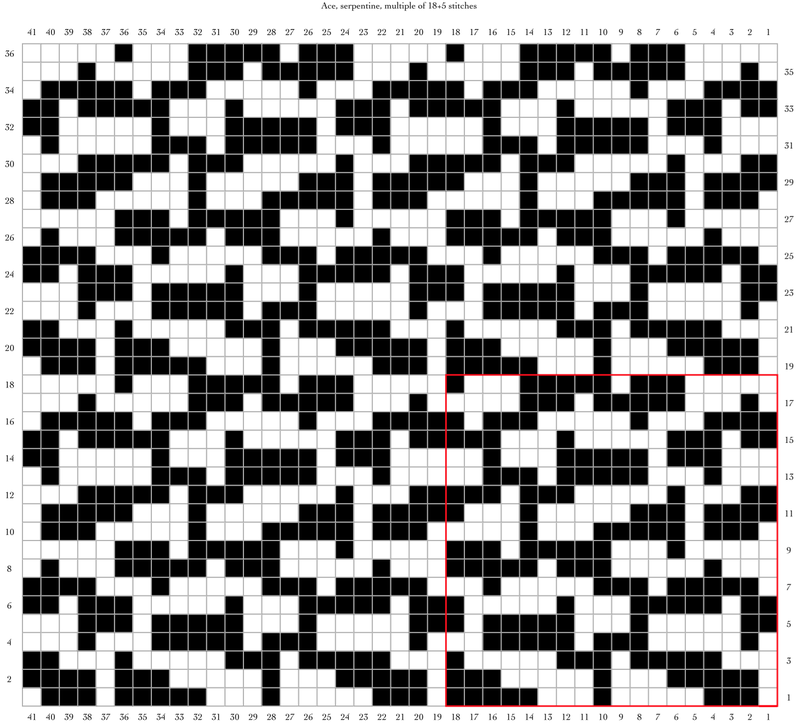 The stitch pattern repeat is outlined in red. Several of these spark my interest quite a bit, particular the 18+3 sequence, though I also have enough experience with knit/purl textures to know that some of the odder-looking ones might look better after being knit up. There is also quite an interesting interview of Cecelia Campochiaro on Tom of Holland’s blog. I really like the 18+5 one! This is really interesting to me—I may have to get hold of the book, as I pretty much fit the ‘recommended for’ exactly. “Libraries worldwide that own item: 1” …Dang! I know people who own yarn shops who don’t want to sell books from Interweave (for example) because Interweave regularly puts them on sale at prices lower than yarn shops can afford. But it bums me out that libraries probably won’t get it as a result; I don’t know many libraries that buy self-published books. Looks like I have to get this one. I like developing reversible knit/purl patterns, but of course don’t posess such expertise. Thank you! BTW, I almost used your fruitbat pattern in a sweater – because I’m batshit crazy and bought new wool instead of working on my UFO pile, and the wool totally looks like something a fruitbat might eat, so your pattern would have fit the theme. However, I’m not sure the complex pattern is really the right thing to use with self-striping sock yarn in amost neon green, yellow and natural shades, so I’m back to the drawing board. It’s instantly become of one the books for what I think of as my core collection. I’m glad it appeals to you too! The fruity yarn for fruitbat is an understandable impulse, but I think you’re probably right about it not actually being a good combination. I look forward to seeing the sweater. A slip-stitch pattern of some sort, maybe? They often go well with multicolor yarn.